Finally I get my hand on one of the ever popular Visual Novel-Strategy Game, the Utawarerumono by Leaf/AQUAPLUS. And thanks to guys from Mirror Moon and Soylations who translate this game so we can play it in english, they even translate the menu and all~ a complete patch. 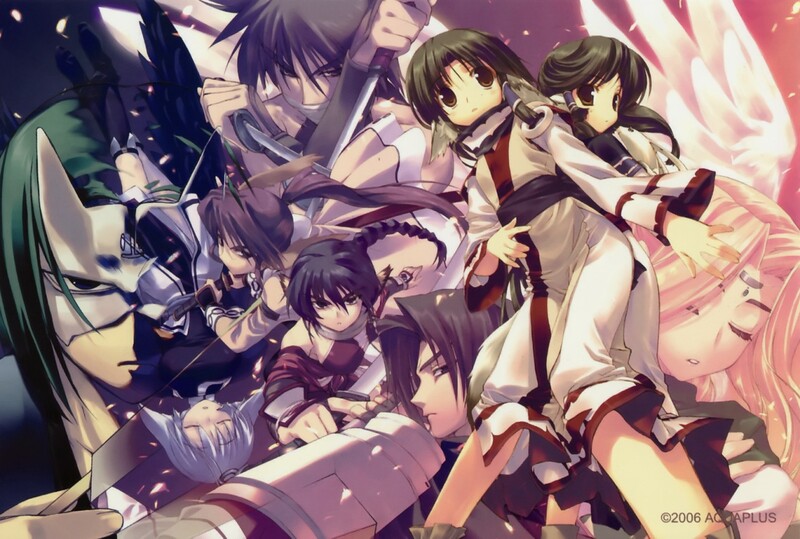 Utawarerumono is a story centering around the masked protagonist, Hakuoro, who one day is found by a family of two girls and their grandmother in a nearby forest close to their village. He is badly injured and is soon found to have amnesia, so they take him to their home and treat him until he is well again. Hakuoro is soon accepted into their village where he stays and lives with them, but before long Hakuoro finds that life in this village is being oppressed by the greedy emperor who rules over the country their village resides in. The story’s genre is at first a fantasy-style story with heavy Ainu influence, though later develops science fiction themes towards the end. Indeed, it first appears to take place in a fantasy world, fully with magical beings and interesting new species of humans, but it is later revealed that it takes place in a post-apocalyptic Earth’s far future.